I FINALLY have a review of Essie's top coat Gel Setter for you today. This has been requested so many times. Since this top coat was released late last summer, I've often been asked what I think about it. I wanted to find out how I truly felt by using it for a long time and then putting it to the test. I wanted to do an Essie Battle of the Top Coats, but I didn't think painting each nail with a different top coat would be an accurate way to see which one performs better because some nails get more use than others and chip quicker. Like my pinky and ring finger on my left hand...they almost NEVER chip even after a week, while my pointer finger can sometimes chip within a day, so no matter what top coat I put on my pinky and ring finger - it would win. I decided instead to paint a full manicure on both hands and test each top coat under the same conditions, with the same base coat and nail polish colour, with the only variable change being the top coat. It's taking me a long time to do this since I rarely have a full week where I can wear the same polish for a week straight. I usually need to change it up so that I can do swatches for my blog. I'm also finding that I have SO much to say on each top coat with a ridiculous amount of photo evidence, so I decided I would focus an entire post on each top coat and then summarize my findings in a Battle Of The Top Coat post to see which one came out the winner. Sound good? I'll eventually show you other Essie top coats, but today we'll just focus on Gel Setter. I wanted to make this top coat battle as legit as possible, so I had some controls to keep it accurate. Base Coat: I struggle with peeling nails, so I used Nailtiques Formula 2 as my base coat in all the tests. I wanted to improve the condition of my nails but also didn't want this to be a test of how strong the base coat was (I'll do that in another battle). This base doesn't claim to make polish last a long time, but to improve the condition of the nails and to stop peeling. **I should mention that whatever worked or didn't work for me, may be different for you. We all have a different chemistry make up of our nails and different products work for different people. I also have nails that peel, so you'll notice I don't have a long wear time on anything. While someone can wear a polish for 7-10 without chips, I really can't. This post is already photo heavy, so I'll just be showing my swatching hand (left). My right hand is my dominant hand. The polish on my left lasts a lot longer than on my right, so if you see a pic, just assume that the right hand looks way worse. Keep that in mind for these results! First, I wanted to test out what would happen with no top coat at all. This way I could really see how good a top coat was performing because I knew what it was like without anything. You can tell Angora Cardi is a good polish because it self-levels and has a great shine. I didn't need top coat to fix flaws or make it shiny. I gently touched a nail after 5 minutes to see if it was at least set, and it left a finger print on my nail (although it's such a self-leveling polish, it had smoothed itself out after a few minutes so that I didn't have it anymore!) It was dry to the touch after 10-12 minutes. If you are curious what "wrapping the tips" means, here's a picture. It means that not only do you paint the polish ON TOP of your nails, you make sure to swipe polish on the tips. This makes your polish last longer. After 35 minutes they were dry enough to move around, but I could still dent them if I really tried. After an hour they were still at the same stage but I had to get on with my day. I started making supper, taking out the recycling and other Mom-jobs around the house and a few nails got some good dents. I've only had this on for a full day and I've already got minor tip wear on my middle and pointer finger with a small chip on my pointer. By the next day, that tiny chip on my pointer had grown a bit and I also had a bit of chipping on my middle finger. By day 4 there was chipping EVERYWHERE. The pinky is still good but that's it. The right hand is even worse. This polish most definitely came off after this photo! Ok, now onto Gel Setter! This claims to have the "cushy, rock-hard shine of a gel, in a foolproof formula for at home manis and pedis". It sounds awesome, so the question I get asked over and over again is "is that really true? Is it as good as a gel mani?" After using this polish for a couple weeks back in the Fall, I posted this Instagram photo to answer that question. I captioned the photo saying "I've had a few people ask me how I like this topcoat and I have to say I legitimately love it. I'm a big fan of Essie's Good to Go topcoat but Gel Setter dries even faster, smooths out every imperfection and gives me a beautiful shiny finish. 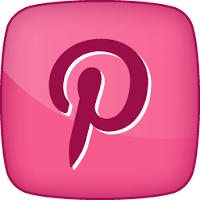 I will definitely repurchase and would totally recommend it." I never say anything on my blog or on instagram that I don't mean, so I truly did love it. It applied beautifully and worked wonders. 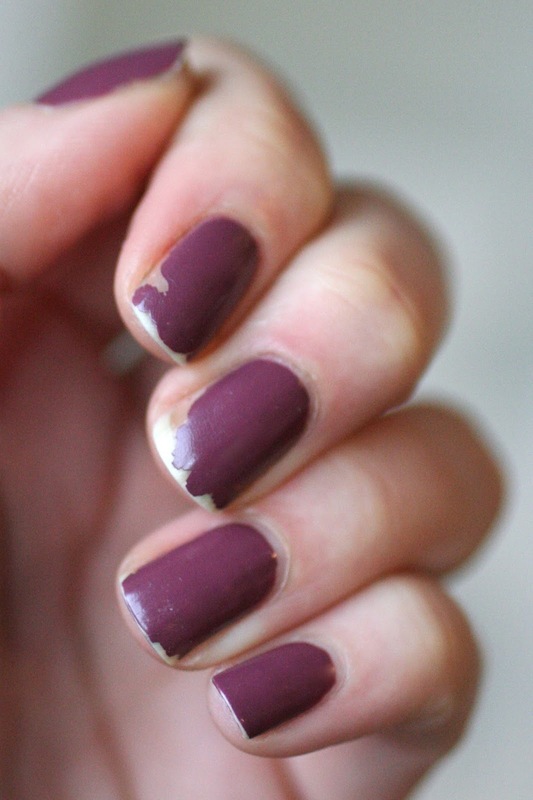 A couple weeks later, I soooo did not love this top coat anymore. After a month or so of using Gel Setter it became very thick and goopy, with long strands of top coat that would dry in the air and leave little threads. I had to thin it out several times to continue using it and it was still a 3/4 full bottle. Over time, it just continued to get worse and worse. By the time I did this experiment, I had owned the top coat for about 3 months. This was an absolute pain to apply. 5 drops of polish thinner weren't enough to thin it this time and after having some goopy uneven nails, I thinned it again. After all that, it's still very thick and still with little threads of polish, making it very difficult to do a thin, even coat. I couldn't wrap the tips because it was too thick and difficult to use. It's failing for me on the "foolproof at home mani" claim. The pro is that it dries incredibly fast and it's really shiny. It's also very self-levelling because the uneven nails had drag marks in them and they eventually all self-levelled. Within 3-5 minutes my nails were dry to the touch. After 15-20 minutes they were dry enough that I could move around and use my hands and not wreck my nails: I brushed my teeth, washed my face, opened containers and put on my face cream. None of that harmed my nails but they still weren't fully cured and I could still dent my nail if I tried. After 30 minutes I crawled into bed. I did read a book for another 30 minutes before I went to sleep but I woke up with no sheet marks on my nails. Surprisingly, I have no bubbling from the very thick top coat either, which I totally thought I would. If you look closely in the photo above, you can see that the top coat shrunk my polish though. You can just barely see the white tips of my nails. Yeesh! It's only day 2 and I've got some chipping around the edges and ALL the nails have tip wear. Not impressed. 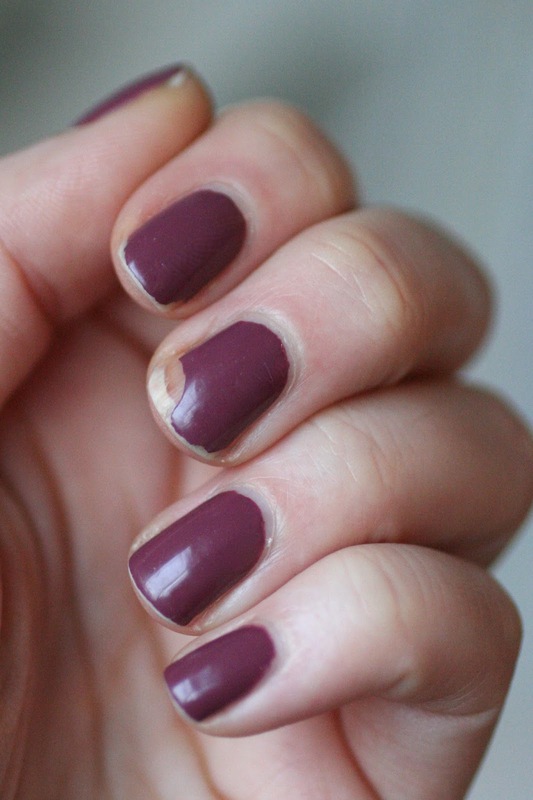 This looks awful, worse than my nails looked on day 4 with no top coat. I had a huge chip on my middle finger with lots more chipping around the edges of my pointer, middle finger and thumb. I left it on for another day and it looks even worse than this, but it's honestly not even worth showing you. 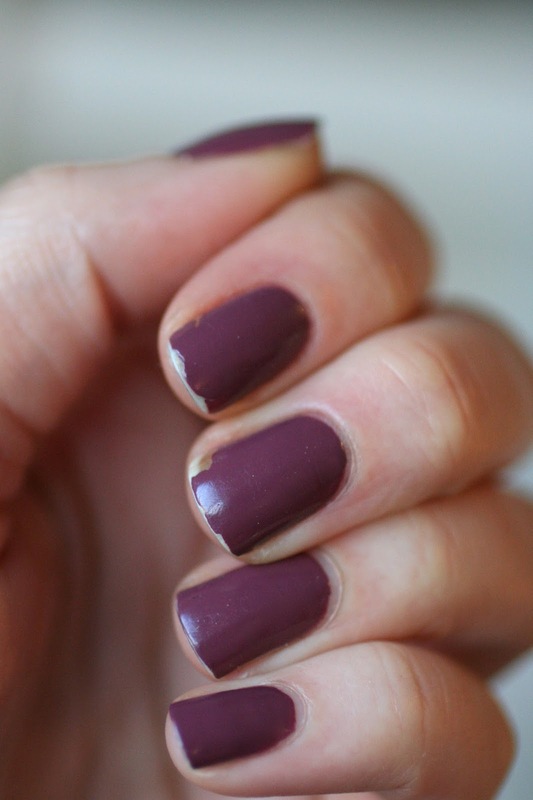 In my everyday life, I would 100% remove my polish if it looked like this. When it's like this, it's also difficult to polish right up to the cuticle, leaving this uneven clear coat around the top of the nail. And this is just ridiculous! The thick top coat would not even out for me no matter how hard I tried and my thumb looked like absolute crap. You can also see the terrible bubbling in this photo. Gel Setter has a tendency to do that sometimes and I haven't quite figured out the exact application to make it not bubble. I've read comments from people at Essie that you need to apply thin coats to avoid this, but as you saw above, that become impossible to do. 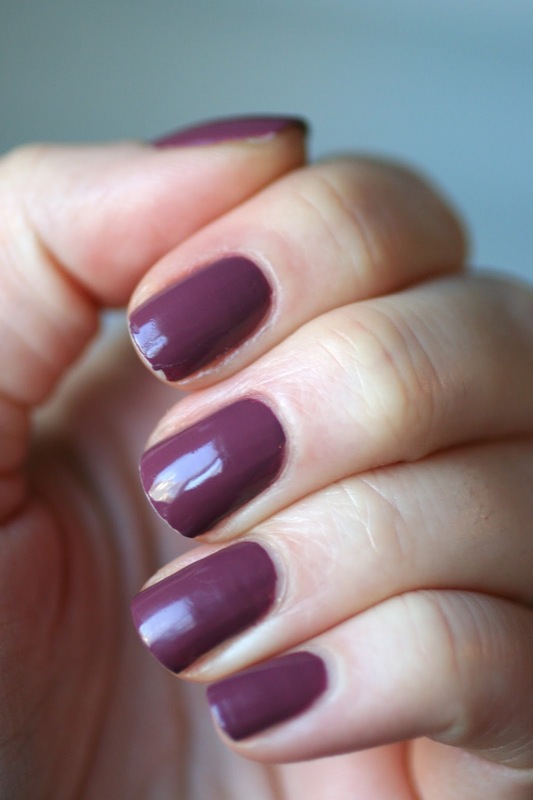 They've also said not to let the polish dry and apply the top coat only a minute or two after you've applied your last coat of colour. I've tried doing it this way and also letting my nails dry for 10 minutes and then applying the top coat and sometimes it bubbles and sometimes it doesn't. There's no rhyme or reason to it, but it's really unfortunate when it does. The bubbling above is terrible but it was obvious right away. I've had it happen where I polish my nails with 2 coats of polish, add Gel Setter top coat and my nails look absolutely perfect and then 10 minutes later I look down and it's full of tiny bubbles that ruin the mani. - It dries incredibly fast. In 5 minutes they'll be dry to the touch and totally dry in 30 minutes. 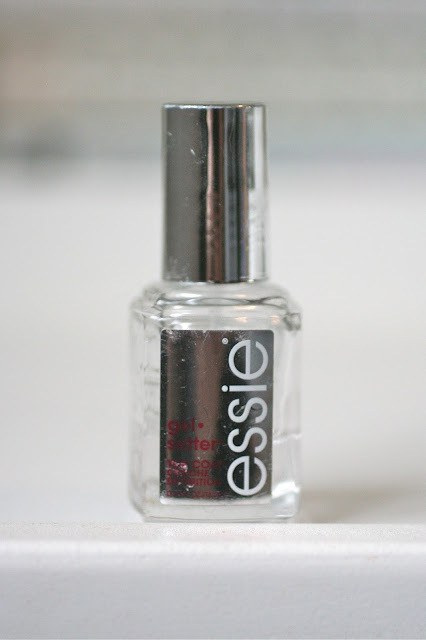 - A brand new bottle will give you a smooth, glassy coat on top of your nails. It self-levels and looks absolutely gorgeous. - It gets gross and goopy quickly. - You can't apply thin even coats once it's goopy. - No amount of polish thinner seems to "un-goop" it. - It's hard to use when goopy. - It sometimes shrinks your polish. - It peels and chips super fast. - It definitely DOES not perform like a gel coat. I do no like this top coat and I will not be repurchasing it. It didn't prolong my mani at all and actually probably even shortened the lifespan since it looked worse than no top coat on day 4. I hate working with the thick formula with those long strands of polish that dry in the air and on the edge of your nail and it can be impossible to apply a thin and even coat. Honestly, I feel bad that I was so quick to say I liked it on Instagram. I thought that trying it for a couple weeks was enough to know how it performed and because I said I liked it, I know others went out and bought it, including my friends. Since then, I've had friends text me and tell me how much they don't like it and I'm sorry! I'm with you, I'm not into this top coat at all. It was nice at first but quickly became a nightmare. 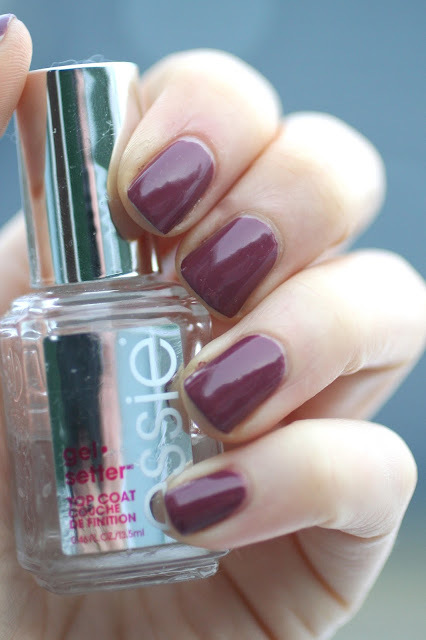 Have you used Essie Gel Setter? What is your experience with it? Oh no!! My bottle is starting to get goopy too and I'm only half-way done with it! :( I'm also getting the thin strands but it still levels for me. Like you said, I loved it when it was brand new, I got, and still get only tip wear, no chips for about 4-5 days. I loved that the shine didn't dull, it just got scratched by normal wear. I'm going to wait for the rest of your reviews on other top coats because I haven't had another top coat that's this shiny. I had such high hopes for this!! Thanks for the review. I was just about to buy this top coat yesterday. I am so glad you did this review today. 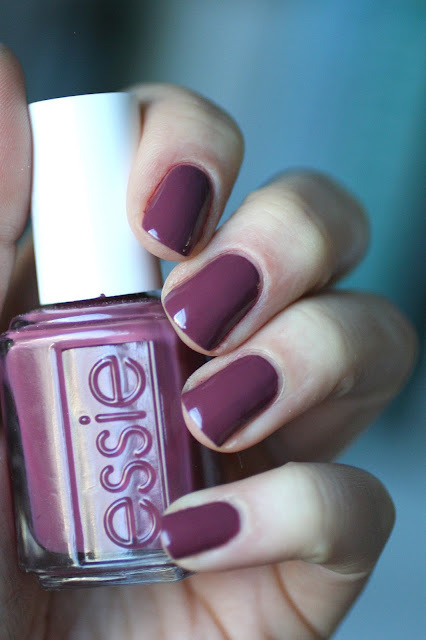 I just bought Essie Good to Go and I am looking forward to trying it. Thanks for doing all these great reviews and the time it takes you. 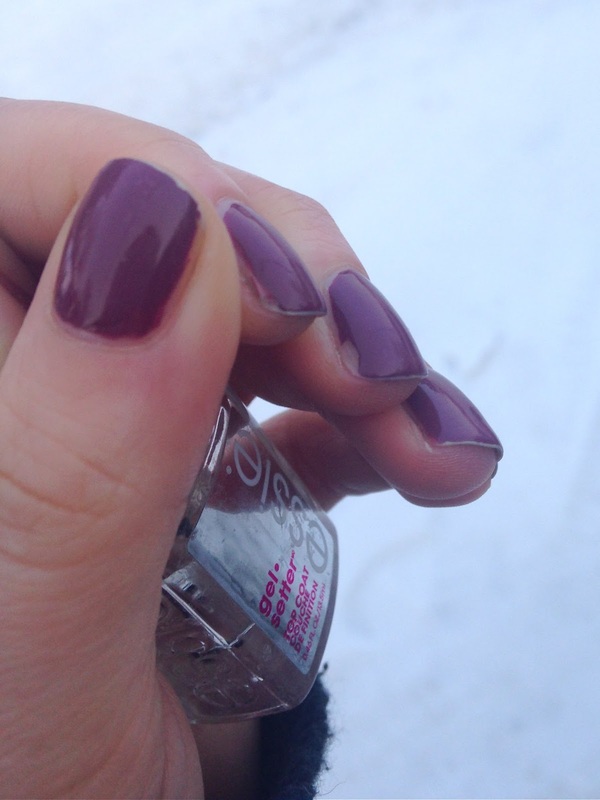 I had the same experience with Essie Gel Coat. What top coat do you use now that you like ? I had a similar experience!!! The first time I used it, I loved it. Very shiny and really lasted. The second time was OK, but by the third time I noticed it was much thicker and it chipped more quickly than the Get Up and Go topcoat. Very disappointing! Get Up and Go remains my favorite top coat. 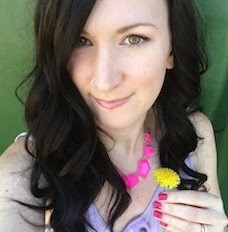 I am so glad I'm not the only one who had the experience with the threads! I kept thinking it was cat hair. Lol. I had bought gel setter because it had less chemicals than seche vite but I'm not impressed. Looking forward to the next review! This product was a big disappointment for me. I so wanted this product to be a winner for me - sadly its not. Mrs. W - I hope yours doesn't thicken up as fast as mine did! Glad it's working out okay for you so far though. Emily - the one I keep repurchasing is Essie Good To Go. I like it a lot but I'm still on the hunt for a holy grail top coat. 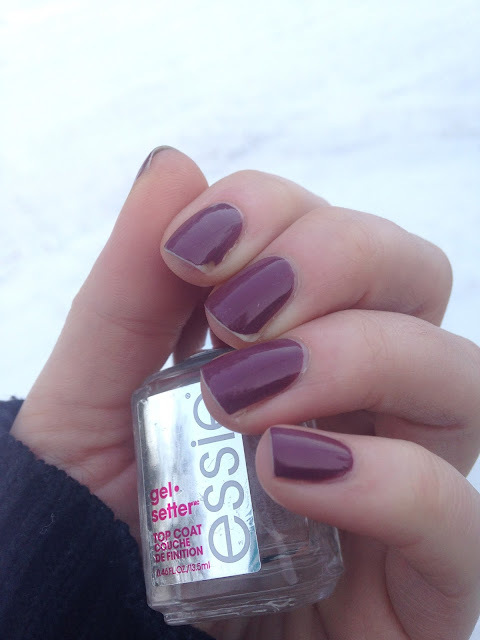 Anonymous - I really like Essie Good To Go. I've been using it consistently for a couple years and keep repurchasing it. I'm still on the hunt for the ULTIMATE top coat though and Glisten & Glow HK Girl Top Coat has been recommended to me a bunch of times, so I'll be purchasing that one next. Felicia, Nicole & Bronco Mom - I'm sorry you guys had such disappointing experiences as well, but also glad that I'm not alone! Hi Emma, I know some people have good luck with it but I definitely didn't! Haha. I'm reading this because I'm also frustrated by how "gloopy" Essie's Gel Setter becomes after only one, or at the most, two uses. Might as well throw it away after it's only 1/4 or 1/3 used! I have a theory that the bubbling is from adding polish remover to try to thin it out when it gets so thick. I can't use it when it does that - irritating! Humm, I should've read this review before ordering not one but two of this top coat. However the issues mentioned here are not new to me, I deal with the same issues with Seche Vite and the red top coat by Sally Hansen, I have to add tons tons of thinner when I am half way through the bottle, I get bubbles specially when I add a layer of glitter, the top coat is goopy and very thick, etc. I have also found that when I am using several top coats at the same time and there is a bigger between one and the next, the top coat gets gloopy faster. So now I start using one until I finish it. 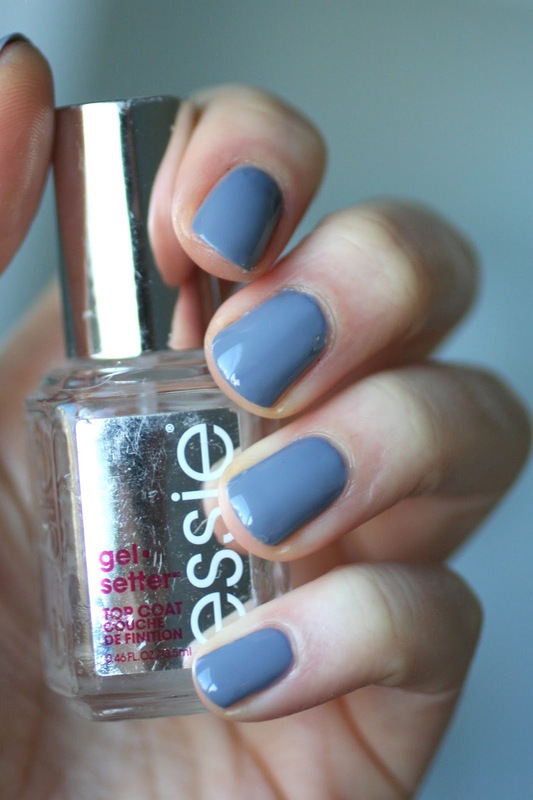 Kendra, in your opinion, what is the best Essie top coat? I have used No Chips Ahead but it takes forever to dry, and I get sheet marks all the time! So as a result of all your comments I reached out to Essie and though they told me it's unusual for this to happen, I mentioned the feedback above, similar to mine and they will be refunding the ful, purchase price plus tax! I'm hoping they will fix the product as well! I don't know whether the blogger was using regular nail polish with Essie gel top coat or gel nail polish but I've used gel nail polish with Essie top coat and had a similar experience as going to the salon to have a mani using gel nail products. The home job using a gel nail polish plus Essie top coat performed very well withou chipping, shrinking or dulling of the sheen. The problem I'm having with the top coat is similar to everyone else, thickening and stringiness of the product with my bottle being 3/4s full! Aside from that, I love the product but won't repurchase as it would be a very expensive proposition having to replace it every few manicures.....not gonna happen!